Building trading tools that are useful. The MQL5 Volume Scanner utility displays a grid of volume vs. period. As trades occur, the volume increases for each period. When each period ends, the bucket is reset to 0. Volumes are sorted from largest to smallest within each shown period. Click any symbol to highlight that symbol in all period columns. Volume information is specific to transactions placed at your broker. Download the MQL5 source code of ATR_for_Stops. I'd enjoy hearing how your use this indicator. 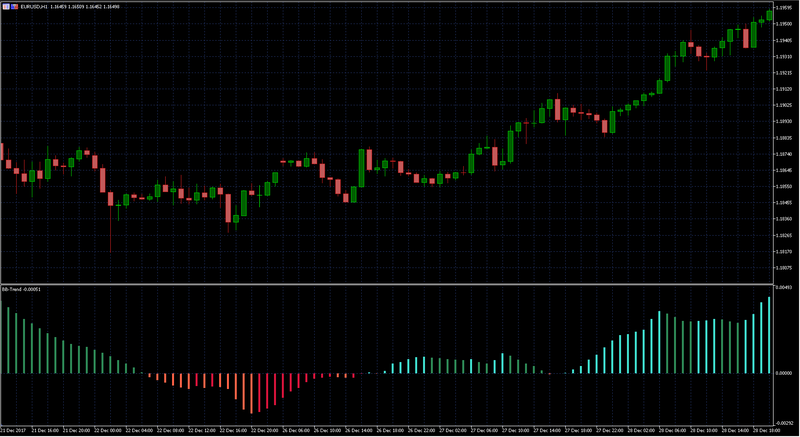 The BB-Trend MQL5 Indicator uses two Bollinger Bands™ to signal both trend and direction. Download the MQL5 source code of BB-Trend. From a given currency pair, determine the base currency, then determine how many of the "other" pairs having that base currency have 20EMA above 50EMA. In cases that the base currency is actually the quote currency of the test pair, reverse the order, i.e. 20EMA below 50EMA. For example: USDCAD has base currency USD. If USDCAD has 20EMA above 50EMA, that's +1. Download the MQL5 source code of OtherPairs. This is a good example of how to program a multi-currency indicator in MQL5. The BB-Flat MQL5 Indicator shows when the Bollinger Bands™ are stable or flat. Download the MQL5 source code of BB-Flat. The Force Index MQL5 Indicator is a direct replacement for the Force Index supplied by MetaQuotes. Their formula is not Elder's formula. This fixes that. Download the MQL5 source code of Force Index. The Index-Finder 1.03 MQL5 Indicator is a tool to find the index number of any bar. I use this indicator ALL THE TIME! Seriously. One of the simplest indicators that's actually useful. Download the MQL5 source code of Index Finder for free. For more information, see the MQL5 post that prompted this tool. This is perhaps the simplest possible MQL5 indicator. If you are a beginner to programmer, you may find reviewing this code to be instructive. The Simple Moving Median 1.04 MQL5 Indicator is similar to a Simple Moving Average (SMA), except it shows the median instead of the average. Download the MQL5 source code of Simple Moving Median for free. For more information, see the MQL5 post that prompted this indicator. Download Version 1.01 version from MQL5.com. The Self-Tuning Envelopes MQL5 Indicator is similar to the Envelopes indicator that ships with MT5. The key difference is that it tunes based upon how many bars you want to "poke through" the bands. Sorry, I am not sharing the source code for this indicator. I wrote a simple test Indicator that synchronizes data from the server and displays the next time frame (nextTF) high on the current chart. SpinEditIncr spin edit control is derived from CSpinEdit from MetaQuotes. I realized there were some other features I wanted from CSpinEdit, so I created my own class. Ability to change the embedded CEdit amount. Ability to turn "spin" off. I had been using SciTE for MQL4 for some time. It works, but I was missing some features. So I gave geany a try. I found someone else's configuration file(s) for geany, I forget where, then changed it to suit my needs for MQL5. I also created my own colorscheme based upon what I used with SciTE for MQL4.